Pickup games represent what’s best in sports—playing for fun, competing in the purest sense, and sharing a rewarding experience with others. There’s no money, no cheerleaders, and no trophies—none of the external rewards that sometimes accompany organized sports. When you participate in a pickup game, you choose who you play with. Other kids can be just like you—the same age, same athletic ability, and same attitude about playing sports. But you can also play with other kids who are either better or worse players than yourself. You can play with younger or older kids. You can play with kids who love sports or those who do so mainly to be part of the group and enjoy sharing the company of others. Unlike adult-run organized sports, you are in control. And this provides you with the opportunity to tailor the games to exactly what you desire. Besides controlling the type of fun you want, you can also use pickup games as a means to practice skills and improve your game. It’s essential for you to understand that different types of pickup games provide you with different benefits. You can pursue competitive play with older, more skilled athletes. This is referred to as Playing Up. This kind of play provides you with an opportunity to test your skills against better players. You can see what works, what doesn’t, and where you need to improve. 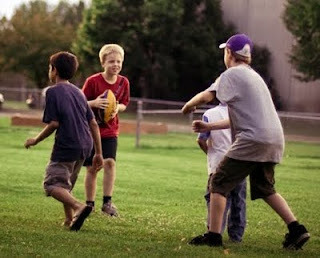 You can observe how these more experienced kids play and possibly learn new skills. You may even find an older kid who will give you some advice and tips. You also have a chance to learn different team roles. Against players who are the same age as you, you may be the star scorer. But against older kids, you will likely find yourself playing a more supportive role (playing good defense, passing the ball, or setting screens for the more skilled players). Learning other roles is beneficial. It helps make you a more well-rounded player that coaches will appreciate—an important asset when you reach a level of play where you are no longer the star player. WARNING: Don’t Play Up with a group of players that have skills far better than yours. If you’re severely overmatched, these types of games won’t help your development (and may hurt your confidence). Much better players will not want to play with you and they’ll let you know it. If you’re unsure whether you’re a fit for a group of players, just hang around to see if you’re asked to play. But be prepared for rejection! 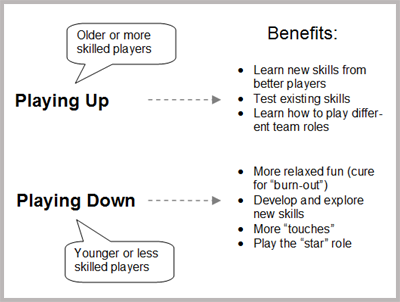 Playing Down is when you play sports with younger or less-skilled players. These may be the kids in your immediate neighborhood who are not especially athletic, but enjoy the communal aspect of playing sports with their friends. You may also find younger kids who love sports, aspire to be more like you, or just want to be included in the neighborhood gang. In either setting, you become one of the better players. First, it provides you with a more relaxed, fun environment in which to enjoy playing. There is little pressure on you to perform, and criticism about your play is unlikely. When you’re burned-out from playing competitive organized sports, Playing Down with your friends can also help rekindle your enjoyment for playing sports. If you’ve just finished a long, hard season, take some time to relax. Decompress. Go out and just “shoot around.” Play some catch with a friend. You’ll feel your joy for playing the game quickly return. Second, Playing Down provides you with an opportunity to develop and try out new skills. You can experiment with different “moves” without any fear of criticism. You can shoot the ball more, receive many more “touches”, and see what it’s like to play the role of the star player. Besides improving your skills, you also gain confidence—an important quality that leads to success in more competitive play. With added confidence that you can do something well, you’re more motivated to practice and continue your development. All of which translates to even greater success against better competition.